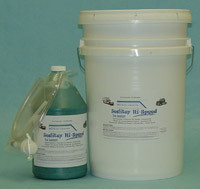 Delta First's Sealitup Heavy Duty is the all purpose and most economical tire sealant. It's specifically designed for the OTR market which includes mining and construction vehicles as well as ATVs, lawn and garden and everything else in between that's used in rugged environments. It's been field proven in over 20 years of use by customers all over the United States. 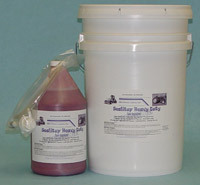 The Heavy Duty formula is a blend of proprietary liquids, clays, gums, and long-lasting fibers with other particles to help seal any punctures which occur. It also has top quality state-of-the-art rust inhibitors to insure that no rust will occur on the rim while the product is inside the tire. The rust corrosion package is specifically designed for tires where the combinations of high PSI and high operating temperatures stress most corrosion packages beyond their limits. Sealitup Heavy Duty Tire Sealant is the recommended sealant for virtually all tubeless tire applications, except where extreme weather or operating conditions are expected. This product seals punctures up to 3/8" (9 mm) diameter and will emain effective in your tires down to 5° F (-15° C). Delta First's Sealitup Premium Heavy Duty Tire Sealant has been specifically designed to meet a different set of operating conditions that are more challenging than normal OTR tire usage. Sealitup Premium Heavy Duty Tire Sealant has added fibers, crumb rubber, shredded rubber, and includes Kevlar type fibers to provide extra sealing capabilities in the most extreme operating circumstances. In addition, it contains extra ingredients to provide superb freeze protection. Sealitup Premium Heavy Duty is ideal for those hard jobs where other sealants just won't work, where you expect an unusually large number of punctures, or unusually large punctures. It will consistently seal holes up to 3/8" (9 mm) in the tread area and is the ideal sealant for waste haulers, cement trucks, farm implements and other tires that are subjected to large punctures and multiple punctures, especially in cold weather. 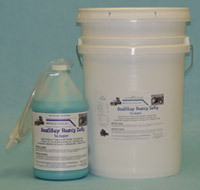 The proprietary formula makes Sealitup Premium Heavy Duty the perfect sealant for extremely cold conditions and will not freeze down to -30° degrees F (-35° C). Sealitup Hi-Speed is designed for vehicles that travel almost exclusively at high speeds such as 18 wheeler truck tires, emergency vehicles, and other vehicles typically on the highway. It contains more thixotropic ingredients (which means it moves more fluidly inside a fast-rotating tire) and a different set of fibers for sealing at the high rotation speeds of interstate travel. Like Sealitup Premium Heavy Duty Tire Sealant, Sealitup Hi-Speed will not freeze down to -30° F (-35° C) and will help tires run much cooler during long interstate hauls. Helping tires stay cool significantly extends tire life. Like all Delta First Sealitup tubeless tire sealants, this product contains a corrosion inhibitor package designed to prevent rust and corrosion as well as withstand the extraordinary heat buildup that occurs in high pressure tires at high speeds. 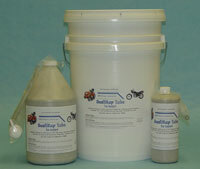 The newest addition to the line of tire sealants is Sealitup Tube Sealant. Sealing a puncture in a tube is very different from sealing a puncture in a tire. While a tubeless tire is "plugged" by a sealant a tube requires an instant "patch" on the inside of the tube. Sealitup Tube creates this patch and will consistently seal punctures up to 3/16" (4mm) in diameter. PLEASE note that Sealitup Tube IS NOT RECOMMENDED in tubeless tires.